I cannot take credit for this recipe. A girlfriend of mine, who is a far superior and much more effortless cook that I, shared it with me. I was a little gun-shy as the last recipe she sent me, I nearly caught the end result of fire which lead to a dinner of take out at the last minute for our household (true story and not her fault, for the record - I got cocky in my cooking prowess). I was downright blissful that this recipe was easy and packed a punch. Instead of using taco shells or tortillas, we opted for an avocado. Preheat oven to 325. Arrange chicken on baking dish and rub with olive oil, including the skin. In a small bowl, combine all spies and rub all over the chicken, including under the skin as well. Roast chicken for 45 minutes. Increase temperature to 425 and roast for 30 minutes more. Remove the chicken from the oven and allow to cool until you can handle. Use a fork to shred the chicken and discard the skin and bones. While chicken is cooling, add shredded cabbage to large bowl. In smaller bowl, whisk together the yogurt, gorgonzola, lime juice, salt, and pepper. Pour over shredded cabbage and thoroughly mix together. 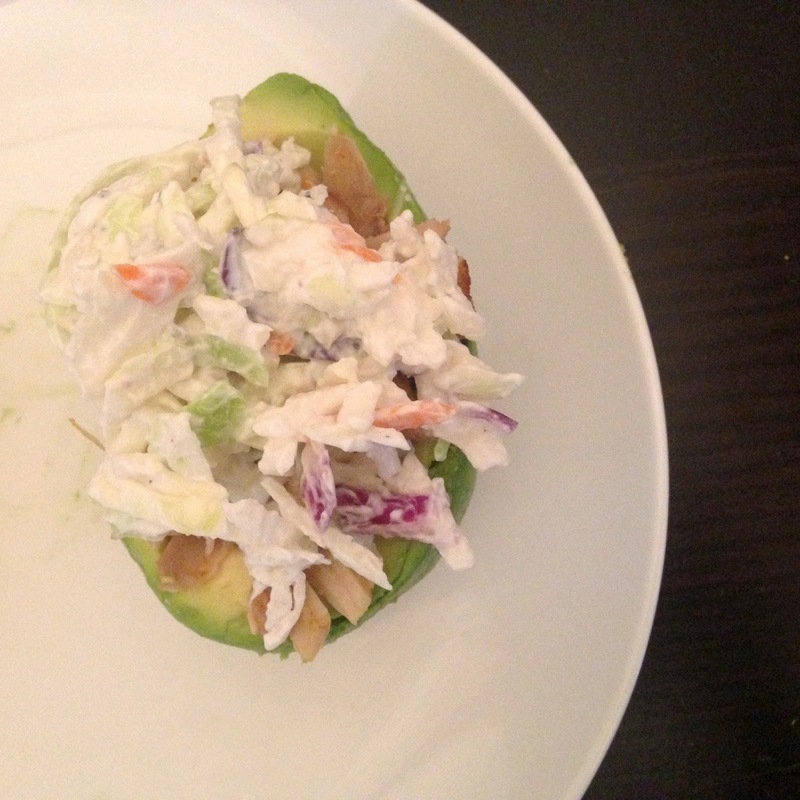 Assemble by scooping out the middle of a half of an avocado, adding the roasted chicken, and topping with slaw and crumbled gorgonzola.